SRL 84:6, Electronic Supplement to Heimann et al. 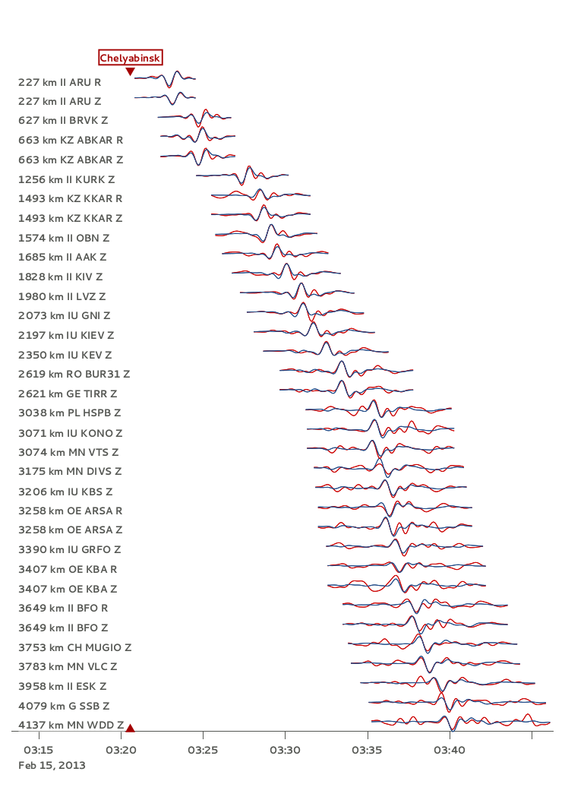 These are the selected, high-quality displacement seismograms (28 vertical and 6 radial) of the Chelyabinsk meteor, recorded at 28 broadband seismic stations. They are shown, with normalized amplitude, in order of increasing epicentral distance. Recorded seismograms are in red, and modeled ones in blue. Each caption indicates the epicentral distance in km, network code (e.g., II), station code (e.g., ARU), "Z" for vertical seismograms and "R" for radial ones. The bottom axis shows the recording time (hours and minutes UTC). The origin time of the meteor's terminal explosion is indicated by red triangles. The figure shows the apparent source-time functions for the Chelyabinsk's meteor terminal explosion. To look for systematic azimuthal variations in the waveform field, we deconvolved the observed seismograms with the synthetic ones for our best-fitting point-source solution in the frequency range 0.005 - 0.025 Hz. 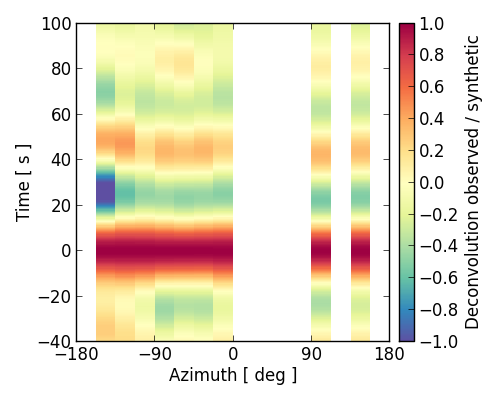 We used a water-level deconvolution technique, and stacked and normalized the station-wise results in 16 azimuthal bins (shown as columns). No significant azimuthal variation of the main pulse width can be observed (red stripes of similar width, at time 0), indicating that the explosion is well modeled as a point source in the frequency range used in our waveform-fitting procedure. Figure S2. Apparent source-time functions. The atmospheric shock wave of the meteor's terminal explosion needed almost a minute and a half to arrive to Korkino, the nearest town. This surveillance video was recorded inside Korkino's corrugated cardboard factory (YuzhUralKarton LLC, located at 61.347° E, 54.902° N). It is reproduced here by courtesy of the factory managers, thanks to the assistance of Mr. Dan Chernovalov. The direction of view is approximately towards NE. The moving meteor lights up the scene, mainly through the windows to the right. These are facing SSE (N 169° E, as measured in a map), towards the meteor trajectory. The extreme, apparent, peak brightness is reached 7.3 s after the start of this recording, and the shock wave arrives at 94.8 s, smashing the right-hand windows. We cannot measure the timing more accurately because of the slightly irregular frame rate. The observed delay of the shock wave (87.5 s after the meteor's explosion at peak brightness) is virtually identical to the one we calculated with our best-fitting explosion source (88 s). Download/View: Video S1 [H.264-Encoded MP4; 8.5 MB]. Meteor’s light and delayed shock wave arrival at a factory in Korkino.